Dimensions: 285 x 120 x 20 mm / 11.2 x 4.7 x 0.78 inch. Buttons: 78 keys (including 13 iPad Hot keys). Weight: 282g / 10.3 oz. Charge Method:2*AAA battery(battery not included). Operating Range: Up to 10 meters / 33 feet. Windows Mobile 5.0 and above. P.S.2: This keyboard may not compatible well with the Windows 10, Mac mini or Moto RAZR. Customer Service: If for any reason you're not happy with our product, or any questions, please contact us freely, we will offer a timely solution for you! Ultra Thin and Light: Compact size (11.2 x 4.7 x 0.78in) and light weight (0.64lb) allows easily carried and packed backpack, messager bag or case. 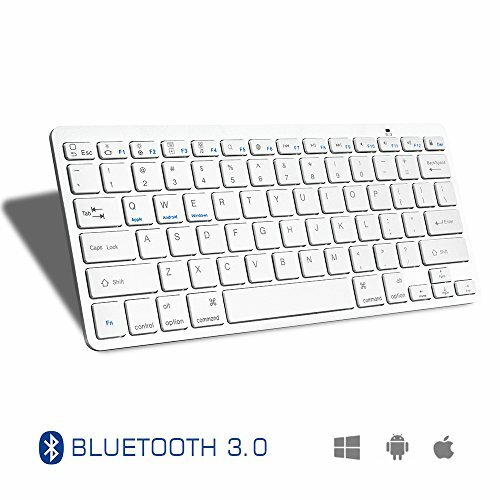 Cable-Free: Bluetooth Connection with your Mobile Devices such as Tablets and mobile phones, bring you more convenient when you need to type(Operating Distance up to 10 meters). Better Typing Experience: Durable Scissor-Switch keyboard provides a better tactile response, comfortable and pleasing typing experience. Super Compatibility: Compatible with iPads, iPhones and Bluetooth-enabled Tablets, Laptops, and Mobile Phones etc. If you have any questions about this product by Accevo, contact us by completing and submitting the form below. If you are looking for a specif part number, please include it with your message.